Every once in a while something comes along - something strange and beautiful - something unexpected. "The Deacy" is just such an amplifier. Now, as you well know, this site is about vacuum-tube or "valve" (as the Brits say it) amplifiers. We love everything tube. We love the sound, we love feel, we love the interactivity and we love the loudness. We also love the renaissance that's occurring with both vacuum tube amps and older style out-of-manufacture pedals where the older schematics and parts are being rediscovered and re-purposed into new, and powerful, heavy music. And just to prove we don't listen to the same thing every day, we even found this band that plays "heavy" without even any distortion or effects. We get diverted too easily. This is another in the "Legendary Amp" series. And we're talking about "The Deacy". Brian May, of Queen, is well known for his trademark sound that consists of using his own homemade guitar, "The Red Special", plugged into a wall of treble-boosted Vox AC-30s. Something that you may not have known (and we hadn't known for a long time) is that Brian also uses a very esoteric and homemade amp that he titled "The Deacy" (pronounced "DEE-kee"). He called it "The Deacy" because it was built by John Deacon, the bass player for Queen. John Deacon spent his undergraduate years at the university learning electronics, earning high grades. As we understand the story, it happened in London. It was 1972 and Queen was just coming together as a band. One night, while walking home from rehearsal carrying his bass, John Deacon walked by a "skip" (in the U.S. we would call this a dumpster) and something brightly colored (coloured?) caught John's eye. In that moment, John's curiosity got the better of him. He paused for a bit, perhaps excited about future possibilities, and went rummaging about in that skip. He found that the bright colored bits were connected to an unidentified circuit board with all the parts still on it. 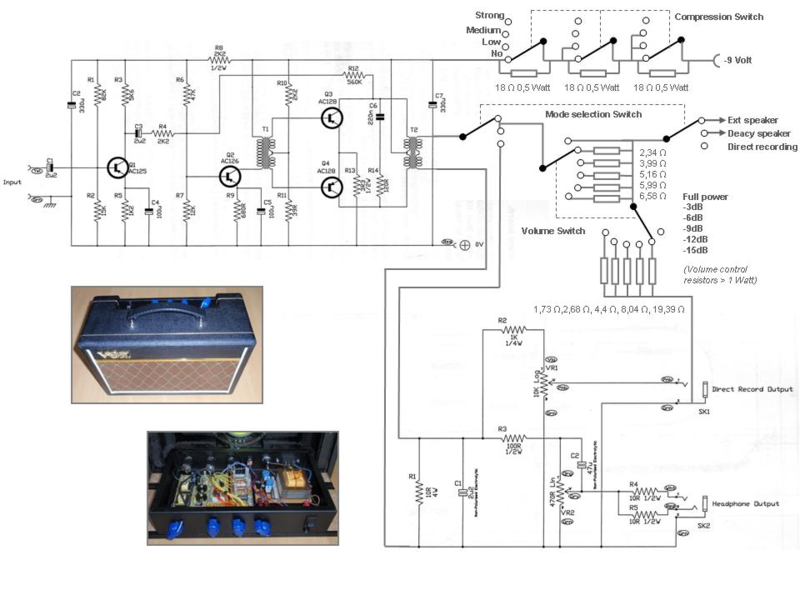 Given his training and understanding of electronics, John recognized that the circuit he happened upon might well be a decent platform for building himself a home amplifier for practicing his bass. So John Deacon took the circuit board home and built himself the amp he imagined. Lo and behold, It worked! 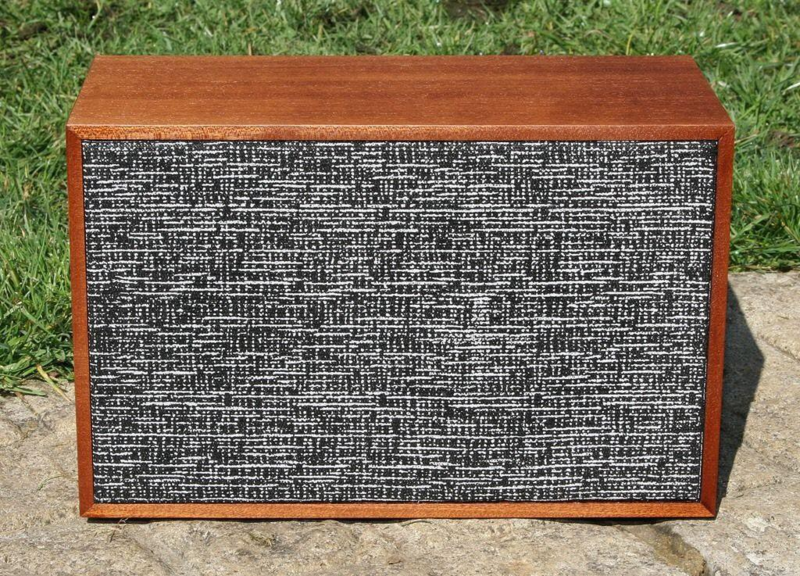 John mounted the salvaged amplifier electronics and circuit board into an old bookshelf speaker cabinet that he had, hooking up the speakers that came with the cabinet, and powering it with a 9-volt battery. The amp was 1 & 1/2 watts or so in output, so it was never, in John's mind, going to be a performance amp. But it worked; and it did what John wanted. He was proud of his creation. He was so proud of his handiwork that he took it to rehearsal one evening and shared the fruits of his labor with Brian. Firstly, Brian was impressed that John had built a perfectly good amplifier with some parts rummaged from a dumpster, and plugged in his guitar and found out it was a nice little amp. Then Brian put his treble-booster between the amp and his guitar and something magical happened. Another part of the Queen sound was born. What makes the Deacy so special is that it doesn't have tubes. Not only does it not have tubes, the electronics that John had scrounged from the "skip" that night in London didn't even come from a radio that was built in England. They didn't come from a radio built in the United States, or Japan (the electronics powerhouses in the late 1960s - early 1970s). The radio didn't come from any European country - or any country known for its electronics manufacturing. As fate would have it, what John picked up that night in the skip were the guts of a Supersonic PR-80; a portable radio built in Southern Rhodesia in 1964. The Deacy uses 4 germanium transistors and two custom-wound transformers. The guts were almost entirely cut-and-pasted from the Supersonic PR-80, and into the bookshelf speaker cabinet that John had. We don't recall how or when we found out about the Deacy, but it was recently. The Supersonic video linked above notes the "world-famous Deacy", but our observation is anything but world-famous. We dug up a few schematics for ourselves and are reposting them here should you wish to take up the goal of building yourself a Deacy. The important parts as we see them are a single AC125 germanium transistor, a single AC126 germanium transistor, and two AC128 germanium transistors - and two custom-wound transformers. We don't currently have the values for the transformers - we'll be on the lookout for them. It is concluded that the combination of the germanium transistors in combination with the custom transformers, in combination with the treble booster, avoid the usual complaints about solid-state amps and give the little amp a sound like no other. They help make Queen sound like Queen. Nigel Knight of Knight Audio Technologies created and sold a number of Deacy replicas - looks like around 50. Wikipedia states that replica parts can be bought every now and then, but that doesn't happen to be our experience. The DoxyWorld from France also has a lot of information on the Deacy and currently (as of the writing of this entry) offers it for sale at almost ridiculous prices. Here at Thermionic Studios, we actually happen to have a number of AC125s and AC128s. We'll have to get some AC126s (if we can) and then tentatively reach out to a few custom transformer winders to see about getting those little transformers. Then of course we'll build our own! Additional information and another fantastic article: https://hackaday.com/2017/05/08/a-queen-mystery-the-legend-of-the-deacy-amp/.